The Western Xia Empire (1038–1227) is kind of mysterious. It was in the area of the northwest where a lot of nomads traveled. Then the Mongols devastated the empire so that few records and little architecture remained. It is known that they had a high culture for their times and fought off much bigger empires for 200 years. They controlled a strategic location desired by other people. The Gansu Corridor where Gansu Province is now was in their territory. The empire was in an interesting region of the world, and they controlled a portal to the east and west. The Gansu Corridor (also called the Hexi Corridor)is a wide and long area of lowland about a thousand kilometers long between mountains and plateaus. Whoever controlled it controlled easy access to the Far East, the trade and military movements. The Silk Road trade route went through it. Historians believe that they had advanced weaponry and architecture for their times and their own writing system. Their music and literature was described as "sparkling". However, historians don&apos;t know much about their history or ethnicity. 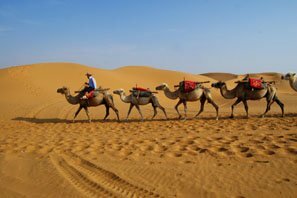 See our Silk Road Adventure tours for a journey into remote landscapes and the remote past. The rulers of the Western Xia were the Tangut people. Little is known about them. The mixture of people in this area was called "Qiang" by those in the Song Empire, but it isn’t certain which specific tribes of people were called "Qiang". Little is known about them except through accounts written by other people. They had a complicated written language, perhaps one of the most complicated ever devised. Like the Chinese language, they used characters, but the characters are much more complex in structure than the Chinese script. Hundreds of records in their language have been found, but scholars still haven&apos;t deciphered the language well. Much of the discovered documents are Buddhist texts. One of their ancestral rulers was named Tuoba Xianbei. He ruled the Tuyuhu Empire from 284 to 670. Tuoba led troops to suppress a rebellion on behalf of the Tang Dynasty at the end of the Tang Dynasty. When the Tang Empire collapsed anyway, the Tanguts refused to submit to the expanding Northern Song Empire. In this way, they established their own small empire in 1038. The newborn empire faced aggressive bigger empires to the east and south. In ensuing war with the Northern Song Dynasty, the battles ended in stalemate. The Song could not conquer them or capture their territory, and the Tanguts&apos; aggressive attacks against the Song ended in failure. A major battle in this war was lost by a leading scientist and scientific writer of the Song named Shen Kuo (1031–1095) who wrote a scientific book called The Dream Pool Essays. He led an army against the Western Xia, but they lost, and Song Empire lost a lot of land that was earlier taken from the Tanguts. The Northern Song Dynasty attacked the Liao Empire together with the Jurchens who were vassals of the Liao Dynasty. They defeated the Liao Empire, but then the Jurchens attacked the Song Empire and captured Kaifeng, which was the Song capital city in 1129. The Western Xia rulers submitted to the Jurchens and became their vassals, and the Tanguts took over much new land as the Song Dynasty retreated across the Yangtze River. Many natural disasters occurred then, and the Western Xia ruler who was named Renzong worked to rebuild the empire. When Genghis Khanrose to power to become the main Mongol leader, he had a dream of conquering everybody. Tribal groups joined him including the Xianbei and the Uyghurs. Mongols repeatedly attacked the Western Xia Empire from 1202 to 1227. The Western Xia defended themselves fiercely, and in 1227 Genghis Khan himself died during one of these attacks on the Western Xia. The Mongols however conquered and destroyed the empire. They absorbed Western Xia troops into their army. 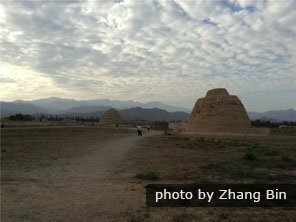 There are places you can visit to see Western Xia sites in Ningxia Autonomous Region and Gansu Province in Northwest China. The most famous Western Xia sites are as follows. Ningxia Provincial Musuem in Yinchuan, capital of Ningxia, displays some Western Xia artifacts, writing samples, and samples of Helan Shan rock carvings. 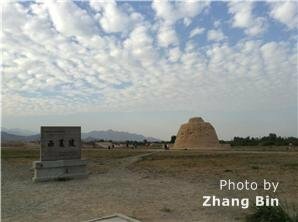 The Western Xia Mausoleum is located at the foot of the Helan Mountain. It is about 30 kilometers west of Yinchuan. There are 9 large pyramids constructed of earth and hundreds of smaller mausoleums. 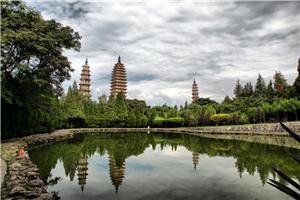 Chentian Pagoda: a Western Xia Pagoda in Yinchuan.